Tired of eating the same thing everyday? Boredom can be an unfortunate part of a healthy eating plan‚ but it doesn't have to be that way. 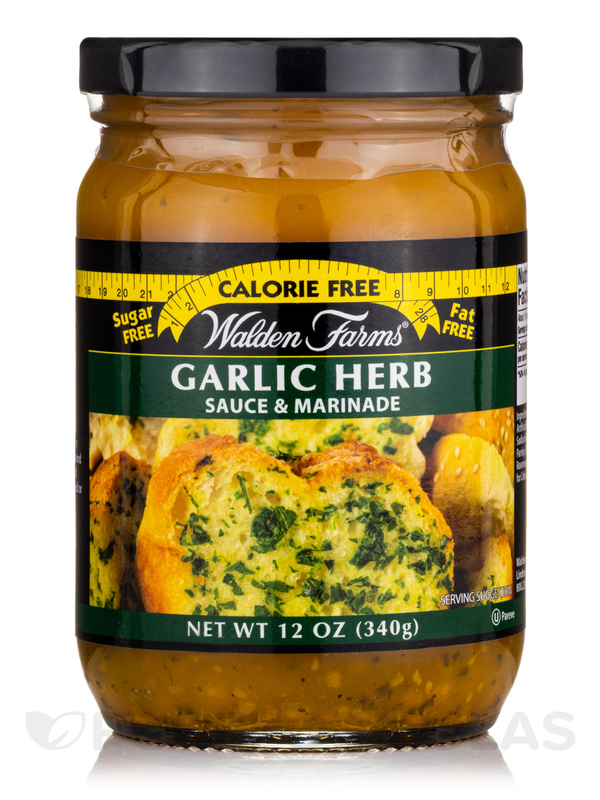 Garlic & Herb Pasta Sauce by Walden Farms adds variety to your cooking while maintaining a nutritious diet. This green pasta sauce is made with concentrated natural flavors that pack a big taste without ruining your diet. These flavors include minced garlic‚ sea salt‚ chopped onions‚ and an array of freshly ground herbs and spices that includes parsley and oregano. The potential uses of Garlic & Herb Pasta Sauce are nearly endless. You can use it as a calorie-free‚ gluten-free‚ sugar-free‚ carbohydrate-free‚ and fat-free marinade for chicken‚ beef‚ or fish. In addition‚ it can be a substitute for stir-fry sauce when making a vegetable stir-fry. It's also great for cooking shrimp scampi. Of course‚ this sauce can be poured over any type of pasta‚ as well. 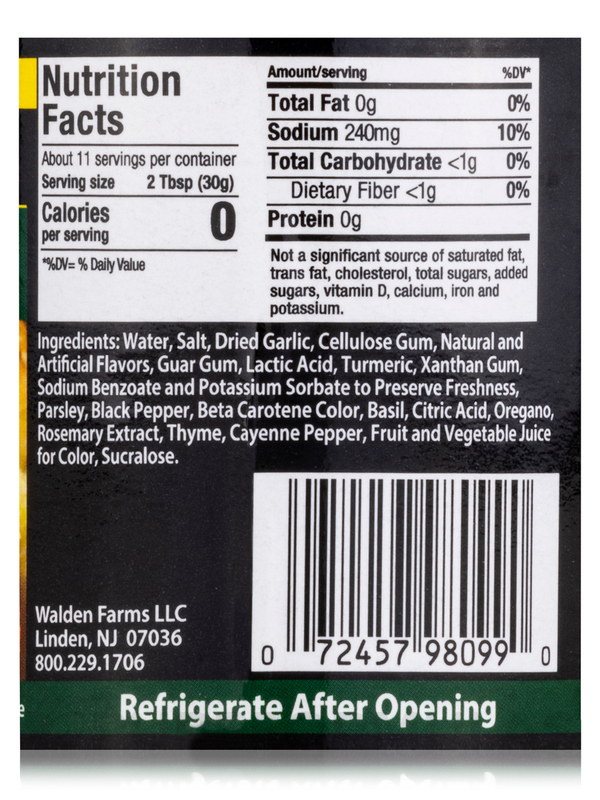 Each can of Walden Farms' Garlic & Herb Pasta Sauce contains 12 ounces. Ingredients*: Triple filtered purified water‚ natural herb and spices‚ vegetable fiber‚ sea salt‚ parsley‚ garlic‚ black pepper‚ cayenne pepper‚ oregano‚ basil‚ onion‚ butter flavor (non dairy)‚ rosemary‚ beta carotene‚ xanthan gum (thickener made from vegetables)‚ sucralose (splenda)‚ sodium benzoate (to preserve freshness). 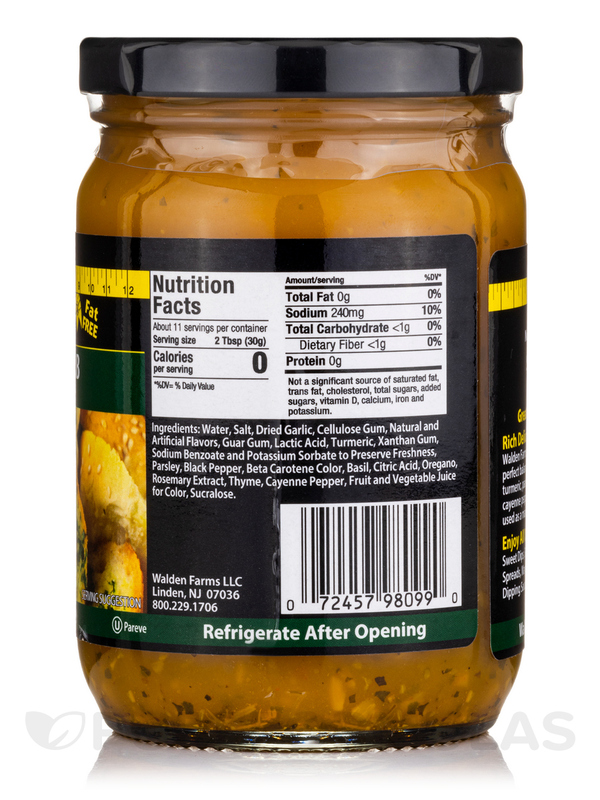 I have used Garlic & Herb Pasta Sauce Jar by Walden Farms for several years when I want to prepare Italian style chicken. I add some oregano and basil seasoning to it, spoon over the chicken, and bake at 450 for 20 minutes. I serve it with angel hair whole wheat pasta, place the cooked chicken on top of the pasta, and pour the sauce over all of it to serve. 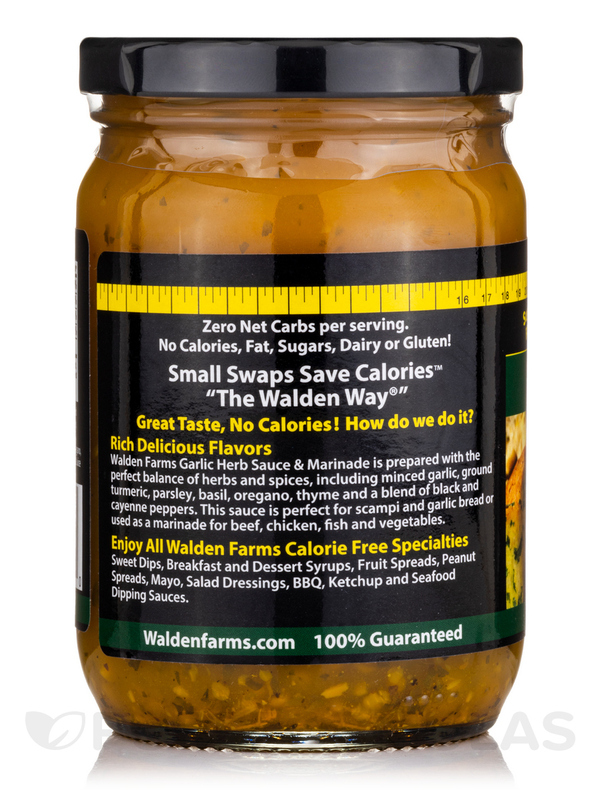 I love this sauce because there are no calories, fat or sugar in it, it's so easy to cook with it, and it makes meals interesting and delicious. Try this! 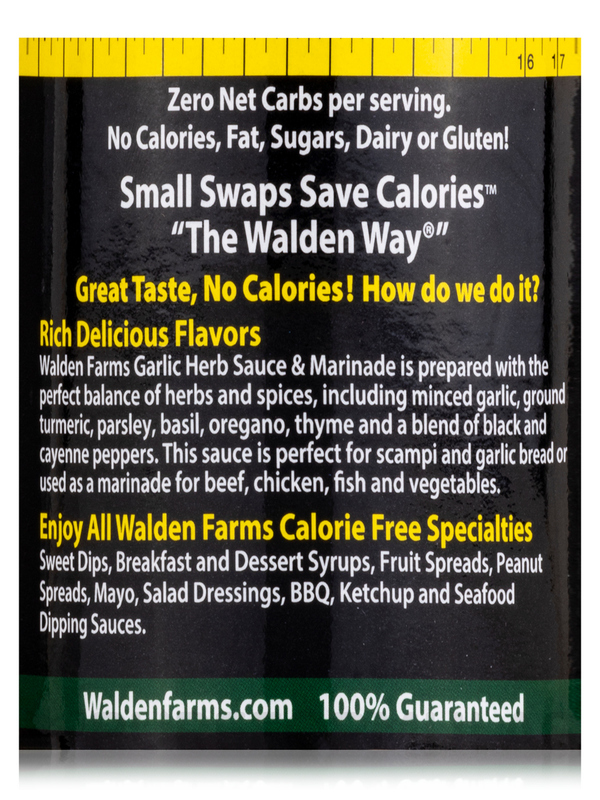 Garlic & Herb Pasta Sauce by Walden Farms has a nice blend of garlic and herbs and the taste is great!